Grand National 2014: Can Wales end 109-year wait? "Getting into the race is hard enough, getting round is more difficult, getting placed is impossible and winning is a dream". That's according to Welshman Evan Williams, who must be the most successful trainer in recent years of the Grand National - without actually winning the race. For the last five years he's recorded a second, fourth, fourth, third and fourth, so if anyone is well-placed to tell you just how hard it is to win, it's Williams. The last time a Welsh-trained horse returned victorious from the big Aintree race was in 1905 when Kirkland triumphed. In the years since, Welshmen have tasted success in the saddle: Carl Llewellyn with wins in 1992 and 1998; Neale Doughty (1984) and Hywel Davies (1985). Several Welsh-born trainers, including Ivor Anthony and Fulke Walwyn, have succeeded, but always from training bases in England. Nigel Twiston-Davies remains the most successful current trainer with two wins to his name in 1998 and 2002, but as another with a base over the border, the wait for a horse trained in Wales continues. So will 2014 see an end to that wait and who is leading the Welsh charge? Trained in Pembrokshire by Rebecca Curtis, he's been the race favourite since winning at Ascot in February. In 2013, the 10-year-old finished third, beaten by nine-and-a-quarter lengths by Auroras Encore, but is set to line up with 2lb lower this year. He's trained at Fforest Farm, five miles from Fishguard on the Pembrokeshire coast, with their own private beach. Teaforthree is regularly exercised along the sea edge and Curtis believes the coastal air is valuable to the success of her horses. After finishing second with Cappa Bleu in 2013, trainer Evan Williams, who trains in Llanfarcan in the Vale of Glamorgan, vowed to return to Aintree and win the race one day and says: "I will because I'm stubborn". But will it be 2014 with the horse he describes as "a quirky old devil''? He goes on: "He is the biggest, laziest horse you will ever meet in your life." Having already finished third in a Midlands National, the nine-year-old then went on to finish fourth in the Coral Welsh National this season, from 11lb out of the handicap. At 66-1 he's a relative outsider in the race, but as Williams says: "He's a strange, strange horse and you could just see him running a big race." And with Williams' pedigree in the race, his comments must be taken seriously. The 10-year-old is stabled with Tim Vaughan in the Vale of Glamorgan. It would be something of a shock were he to win, but it's hard to know what to expect as he has only had two runs in Hunter Chases since 2012. 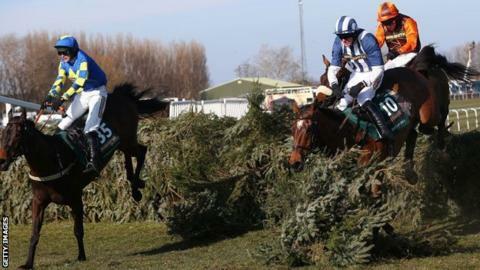 The chaser did win easily on his latest start, but that was a world away from what would be required to be involved in the finish of a Grand National. Vaughan had his best result in the race 12 months ago with Saint Are, finishing ninth, but that horse missed out on making the 40-runner field being horse number 46. A few years ago trainer Michael Scudamore was playing flanker for Ebbw Vale RFC and for the Newport Gwent Dragons' Under-21 side, and now he has one of the leading fancies for Grand National with a horse where the rugby theme runs throughout. The story of a well-oiled 'Tinds' (ex-England rugby captain Mike Tindall) bidding on a horse at the Cheltenham Sales has been well documented, but no-one could have predicted the story since then. Having roped in fellow rugby union internationals, James Simpson-Daniel and Nicky Robinson, the horse won the Welsh National last season, beating Teaforthree that day. He's also posted a pair of Grade Three three mile-plus chase wins at Cheltenham and much of his success is attributed to the Queen's granddaughter, Zara Phillips. The horse visits Phillips' yard once a week, where under her instruction, Welsh jockey Tom David has helped the horse improve his jumping. Welsh National winner Mountainous will be trying to emulate Corbiere who was the last horse to win both the Welsh and Aintree Grand Nationals in the same season in 1982-83. The Welsh National has a fine record as a National trial with Earth Summit, Bindaree and Silver Birch going on to win at Aintree in subsequent years. His trainer, Richard Lee, curiously has a Welsh postcode, but is actually based on the Shropshire/Herefordshire border, but the horse is Welsh owned by Powys-based James and Jean Potter as well as Ffos Las chairman Dai Walters. Jockey Sam Twiston-Davies has another high-profile assignment for trainer Paul Nichols, as he will ride Tidal Bay in the big race. The 21-year-old Welsh jockey has a decent record over the big fences. He finished fifth in his first attempt on Hello Bud in 2010 when the jockey was just 17 and in the midst of AS exams. In 2012 he enjoyed a famous day when he won both the Beacher Chase and Grand Sefton Chase. He has the pedigree as son of trainer Nigel Twiston-Davies, who has trained over 1,000 winners under National Hunt rules, including two winners of The Grand National, Earth Summit and Bindaree. The 1905 winner, Kirkland, like Teaforthree, was also trained in Pembrokeshire at Edward Thomas's Lawrenny Park yard. The Kirkland Arms in Narberth is named after this horse, who was trained 12 or so miles away and who was walked to Narberth station to take the train to Liverpool for the big race. On his winning return, it's said he was stabled at the pub for the night (the inn was called the Commercial Hotel in those days) and the landlord charged the public 6d (2.5p in today's money) to see the great horse. The Teaforthree Arms might not have the same ring to it, but is a real possibility with Curtis's brother, Darren the landlord of the local Golden Lion pub in Newport, Pembrokeshire.